This blog post is all about the architectural specifics & performance optimizations for the Clustered Columnstore Indexes. 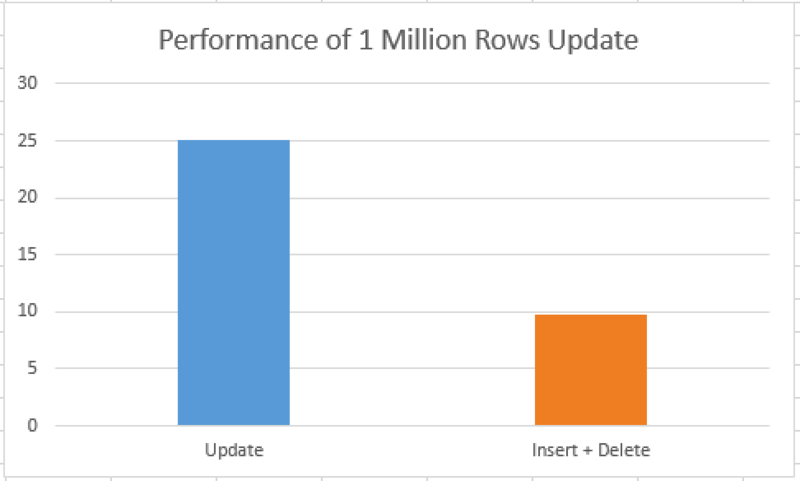 It is known that Inserts are mostly faster than pure Update operations, since we could get less page splits (when inserting ordered data), but what about the latest & the greatest Clustered Columnstore Indexes in SQL Server? We know from the 1st blog in this Clustered Columnstore series, that an Update in Clustered Columnstore Indexes is being executed as a update of the Deleted Bitmap structure for the rows that we are modifying and the newest values are inserted into a Delta Store, so we can say that Update operation is actually being executed as an Delete + Insert. I wanted to see how fast/slow the Update operation looks like when compared with a direct Delete & Insert operations. So lets restore a fresh copy of the ContosoRetailDW database (download it for free). Now we are ready to run a couple of tests and to compare the performance and the impact of the Update Statement with the Direct Delete + Insert operations. In order to minimize the impact I shall try to update only 1 Million rows out of our 12.5 Million rows table. The key performance indicator here is the actual Columnstore Index Update operator at the execution plan – it runs in the Row Mode. Also, we can clearly see that this operation has modified 3 different Row Groups where updated rows were located, plus we have received a new Delta Store which is storing our 1 Million rows. Now lets get to the Delete + Insert operations. which are quite nice in my opinion. We can actually speed the whole insertion process up by using Bulk Load API or even running our loads in Batch Mode, so it is a very clear indicator of a better way to work with new data when updating a table. Not only it looks over 2.5 times faster to delete & insert data instead of executing a direct update, but such aspects as locking & blocking can become quite an issue as it was shown in the 8th part of the series Clustered Columnstore (Locking). Whenever you start working with SQL Server 2014, think twice if you really want to update your data or you just want to delete it and insert/load new information directly into the table. Does this apply to SQL 2016 as well? For SQL 2017 is it true there is in place updates now? So this would improve? to my knowledge there are no improvements in this area.